September was a busy month for Eliza Tredwell. After spending summer vacation at the family farm in Rumson, New Jersey, this mother of seven children (ranging in age from 3 to 17), returned to the city and faced the task of back-to-school shopping. Like today’s mothers who endure long lines at Staples, Mrs. Tredwell likely dealt with the crowds at such shops as H. & S. Raynor, on the Bowery, and C. Shepard & Co., on Fulton Street, to buy ledgers, notebooks, and writing instruments for her children’s school work. She also may have patronized clothing stores such as Brooks Brothers or Lord and Taylor’s, on Catherine Street, to outfit the children for the school year. What made 1838 different was that her 11-year-old son, Samuel Lenox (1827-1917), was enrolled in boarding school for the first time. Leaving home at a young age to attend school was not unusual, for in the early 19th century, most schools of higher education enrolled students between the ages of 12 and 15. On October 1, 1838, Samuel began his first year at St. Paul’s College and Grammar School, located over six miles from Manhattan in College Point, on 100 acres along the shore of Long Island Sound (now part of Queens). 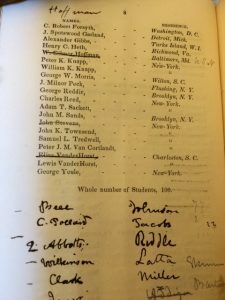 In the Introductory Class, he counted among his 31 classmates members of the Van Cortlandt, Morris, Jones, and other distinguished New York families. In addition, Samuel needed a bible and a prayer book, both stamped with his name. Founded in 1835 by Dr. William Augustus Muhlenberg (1796-1877), St Paul’s College and Grammar School had as its objective “the intellectual and moral education of Boys, in accordance with the principles of the Protestant Episcopal Church.” An early “Church-School” scholastic model that combined a classical education with the tenets of Christianity, it sought to provide both academic rigor and moral lessons, while emphasizing the familial nature of the school. The curriculum, taught by distinguished professors and clergymen (among whom was Reverend Samuel Seabury, the son of Seabury Tredwell’s namesake), included Greek and Latin classics, mathematics, Scripture studies, French and English literature; and, (unusual for the time), physics, geology, chemistry, and anatomy. The skills of elocution and recitation were also highly valued and emphasized in the daily studies. Corporal punishment was forbidden; monthly reports of the students’ progress, including marks for “disorder,” were sent home to parents. Viewed as a superb and progressive school in its time, St. Paul’s saw many of its graduates go on to esteemed colleges. St. Paul’s also offered a “Mercantile Studies” program, in which students took courses such as Merchandise and Commerce, Laws of Trade, Statistical and Commercial Geography, and Bookkeeping. For reasons unknown to us, Samuel did not choose this program. 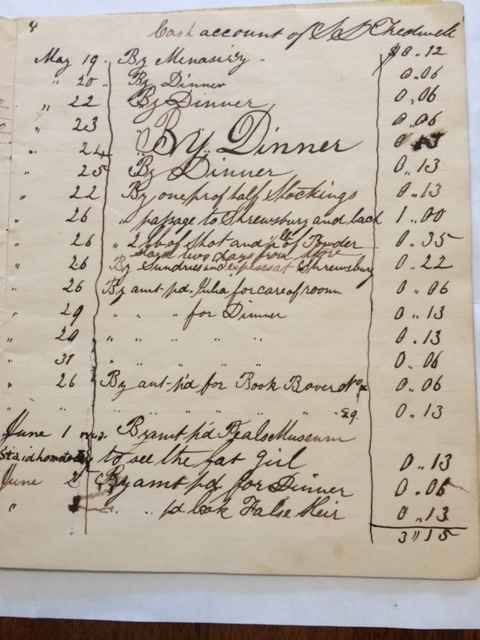 Page from Samuel Tredwell’s Cash Book, 1843. (MHM Archives). The daily schedule at St. Paul’s was long and regimented, but three hours of every day were set aside for recreation. Saturdays were devoted to play and to the welcoming of visitors. Situated on an idyllic peninsula, the campus of St. Paul’s was ideally situated for outdoor sports. The boys enjoyed rowing and swimming in a cove immediately in front of the school, as well as ice skating, gardening, and riding. Several religious festival days, including the Epiphany and St. Paul’s Day, were celebrated with the cancellation of classes, and with “huge” cakes and other sweets provided by parents. 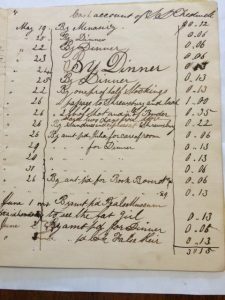 Samuel’s 1843 cash book paints an amusing picture of the school life and antics of a 16-year-old boy. Among his purchases that year were boots, an accordion, fishing tackle, a lock of “false hair,” and entry to “Peal’s Museum to see the fat girl.” Samuel must have broken the school rules when he paid 31 cents for a dog named Nip, only to pay Charly 6 cents to take care of Nip for one day! And, on at least one occasion, he broke the rule that forbade visits home to parents, when he traveled by boat to Rumson and back. Due to lack of sufficient endowment funds, the New York State legislature repeatedly denied St. Paul’s College a collegiate charter, which in effect forbade the school from granting degrees. 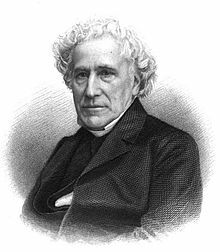 In 1846, after 11 years of service to the school, Dr. Muhlenberg resigned his position to become rector of the Church of the Holy Communion in New York City. Despite their best efforts, the lack of funds forced the administrators to close the school in 1850. The buildings and land were sold to a private developer. 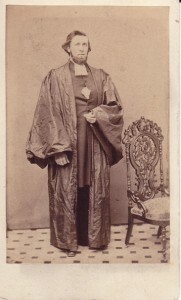 Sometime after 1843, Samuel Tredwell left the school. According to city directories, by 1845, at age 18, he was back home on 4th Street, working as a commercial merchant on Front Street. On December 13 of that year, he began a four-year law clerkship with his brother-in-law, Effingham Nichols, an attorney in New York City, while simultaneously continuing as a commercial merchant and, in 1847, as a distiller on Water Street. The law must not have been Samuel’s cup of tea, for in December 1848, he took over his cousin’s crockery business at 195 Pearl Street, an enterprise he owned until 1854. Samuel had followed in his father’s footsteps after all, literally walking down the same street, to become a merchant. An Account of the Grammar School, or Junior Department, of St. Paul’s College. New York: F.C. Gutierrez, 1842. New York Historical Society Library. Ayres, Anne. The Life and Work of William Augustus Muhlenberg. New York: T. Whittaker, 1889. Accessed September 8, 2016. www.anglicanhistory.org. 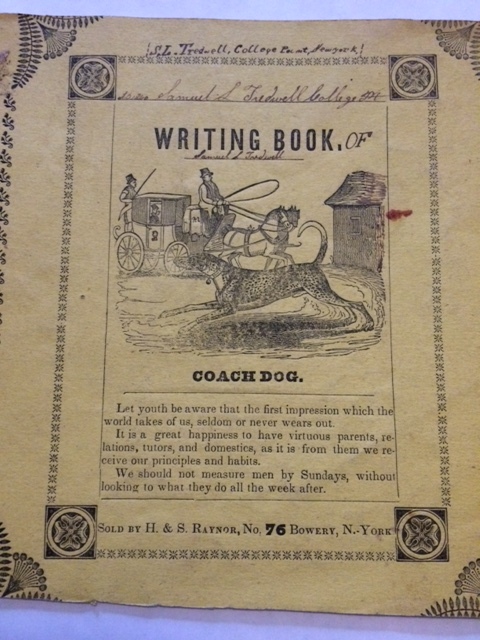 Cash Book, S.L.Tredwell, College Point, N.Y., 1843. Merchant’s House Museum Archives. 2002.4602.27 Box 3. 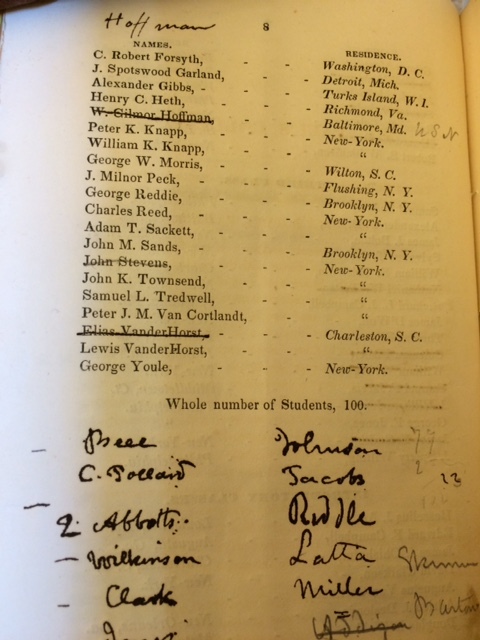 Catalogue of the professors, instructors, and students of St. Paul’s College and Grammar School, for the session of 1839-40; together with the act of incorporation, constitution of the college, board of visitors, course of studies, discipline, &c. and observations addressed to parents intending to place their sons in the institution. College Point, N.Y. : [s.n. ], 1840. New York Historical Society Library. Doggett’s New-York City Directory. New York: John Doggett, Jr. 1846-1854. New York Historical Society Library. Hunt, Thomas C. and James C. Carper, eds. The Praeger Handbook of Faith-Based Schools in the United States, K-12, Volume 1. Santa Barbara, CA: ABC-CLIO, LLC, 2012. Journal of Saint Paul’s College, Feb., 1844, Vol 1, no. 1, College Point, NY: Charles R. Lincoln, 1844. New York Historical Society Library. Manuscripts and Archives Division, The New York Public Library. 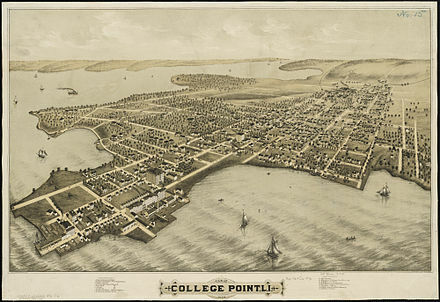 “College Point in 1839” New York Public Library Digital Collections.1854. Accessed September 7, 2016. http://digitalcollections.nypl.org/items/ecfc2630-e5fd-0132-978d-58d385a7bbd0. 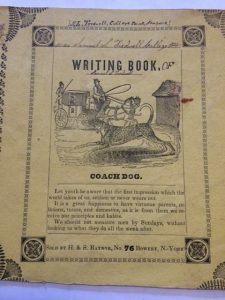 Writing Book, S.L. Tredwell, College Point, NY, 1843. Merchant’s House Museum Archives. 2002.4602.28 Box 3. Great informative article! Educational opportunities were certainly much more plentiful in New York than California during the first half of the 19th century. Several of the more prominent citizens here in SLO County (on California’s Central Coast) were educated in the east, including Robert Edgar Jack, who clerked at an NYC firm then fought briefly with the Union army near Gettysburg before heading west to make his fortune in California. Thanks, Eva! I’m so glad you enjoyed the post, AND that you got the title reference!! I’m glad you enjoyed the article, Mr. Ramirez, and that you find it useful for your students. Stay tuned for further blogs gleaned from the Tredwell archives! Times change! Fortunately no school today would find it impressive that nine of their students had died or contracted a fatal illness. They’d be more likely to brag about their diverse student population. Not one of St. Paul’s strengths. Perhaps the Common Core of the time. The more I remember my disinterest in Latin, the more I wonder what saver school would have had me in the mid-19th century. Thank you so much! I’m glad that Samuel’s father had a progressive view of education for his son. The daughters’ education, however, was very much in keeping with the times. Stay tuned for my September post!